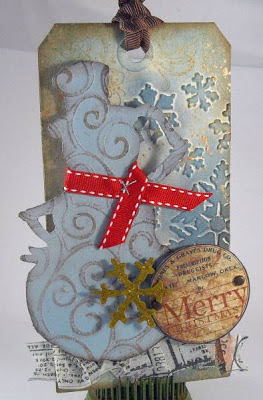 Metal Foil Sheets - I love the foil sheets...they are seriously so much fun! My card above is showing off one of my favorite things to do with foil sheets...emboss! Slide a piece of metal foil sheet into an embossing folder and you've got a masterpiece on your hands! Add acrylic ink and things get even better! White Gel Pen - I love my white gel pens so much I have about four of them sitting on my desk (just in case one gets lost, which always seems to happen when one lives with two little boys). I use my gel pen for faux stitching, in my art journal, for adding highlights, for creating doodle accents, and for every other thing in between! Tags - I'm a huge fan of tags and love that Inkssentials now offers every size and color of tag you can imagine. Manila, kraft, black, small, large, and even extra large! 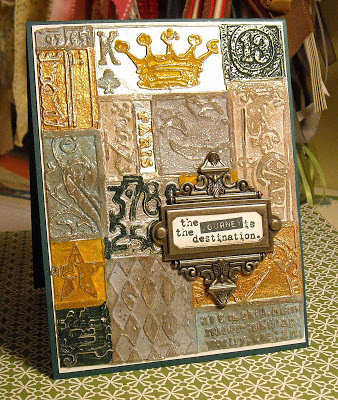 Tim has made tags fashionable for every ocassion; use them on gifts, cards, scrapbook pages, art journals, or heck...frame them and put them on your wall! The possibilities are endless! You can even purchase packages of ATCs in the same three great surfaces! Sticky Back Canvas - Another all time favorite product and one that I use frequently. (I especially like the ATC size, shown above, as it's perfect for cards!) 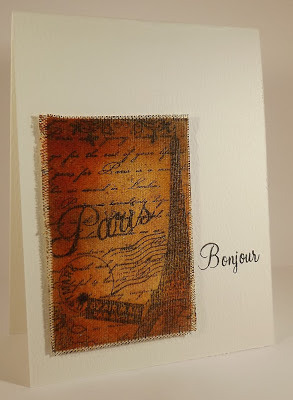 You can use canvas with stamps, paints, stains, and inks. You can emboss it, color on it, distress ink, and stamp on it. I love the texture and look of canvas...so pretty! That's just a few of my favs...but there is so much more to choose from! Check out our entire Inkssentials line and this week receive 10% off of your Inkssentials order! Use code INK10 when checking out and enjoy! What a lot of lovely Inkssentials goodies... I'm right with you on being a big fan! Great projects, Kim. Love what you did with the metal foil sheets and the texture fade!